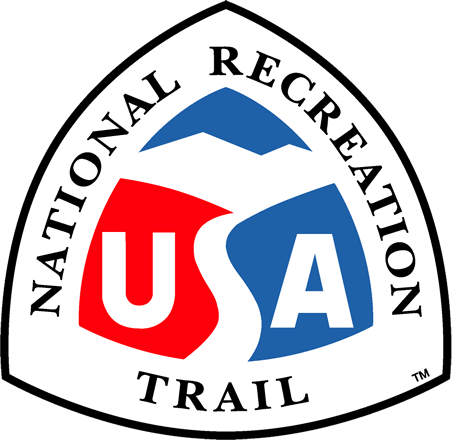 McTrail is a trail through scenic Marion County, WV that is highlighted by a 1,200 ft. lighted tunnel, and a trail head ending at Prickett's Fort State Park with a rest area built to resemble an old train stop. Location: Railtrail that connects Prickett’s Fort state park to the corner of Winfield St. and Morgantown Avenue in Fairmont, WV. Winfield Street Trailhead: From I-79 exit 139 Heading south take right. Heading north take left .5 mile to intersection of Rt. 73. Take left on Rt. 73 one mile to a right on Suncrest Blvd. .25 a mile to 4-way intersection. Take a left Morgantown Ave. .5 mile to left on Winfield St. Trailhead is 1/10 mile on left. Prickett's Fort Trailhead: I-79 exit 139. Heading south take right. Heading north take left. .5 mile to intersection of Rt. 73, Meadowdale Road. Take left on Rt. 73. 1/10 mile and take right on County Rd. 72 two miles to the entrance of Prickett's Fort on the right. Follow brown state park signs. Enter park and .25 mile trailhead is on left. McTrail provides a safe place for children and adults to bike ride, roller skate, walk, run, and many other activities over a 2.5 mile trail. The main purpose of the trail is to serve the community. There are bike rentals available to patrons at the Prickett's Fort trail head. The Prickett's Fort trail head is highlighted by a re-creation of an old train stop that has benches that patrons can use. The Prickett's Fort trail head also has access to the Prickett's Fort restroom facilities. There is a 1,200 ft lighted tunnel approximately one quarter mile into the trail that has been refurbished on the Winfield Street side of the trail. There is ample parking at both trail heads with ADA parking available. The trail was started in 1989 when Marion County Parks and Recreation Commission (MCPARC) bought 125 acres of Monongahela Railroad property. The trail was completed in 1993. The Meredith Tunnel that is the key point of the trail was built in 1914 and was refurbished for use in the trail. In 2001, MCPARC decided to build the connector trail to connect to the Mon River Trail system. The southern trail head was completed in 2004.The northern trailhead was completed in 2008. The trail now has asphalt from end to end and has two very well maintained trail heads. The trail is maintained by maintenance staff that empty garbage receptacles, keep the grass mowed, and walk the trail on a regular basis for repair needs. We see our trails as a point of pride for the entire community. The community shows its pride through its volunteer efforts. We offer a program called adopt-a-trail that allows different community groups, or individuals to help maintain sections of the trail. We not only have our maintenance staff, but we have many different volunteer groups that offer to do trail clean up and maintenance days throughout the year. The public support that we get for these trails is how we can tell that they are really something special. We do have a few rules that the patrons must go by. We require that bicyclists fifteen and under wear helmets at all times, and they must pass on the left. We have pet waste stations set up so that all patrons can clean up after their pets, and they must keep their pets on a leash. We do not allow camping or the building of fires on the trail. Hunting and ATV riding is prohibited on the trail. We want to preserve the trail and the wildlife around it to the best of our abilities. The wildlife at our trails is one of the things that make it very special. It is a great place to go bird watching, or maybe watch a few squirrels playing in the leaves. We have locations in the trail were beavers can be seen. There are plenty of deer in the area. The majority of the trail is within a wooded area. We offer a brochure to patrons from our kiosk that allows them to interact with plant life by using leaves to identify different types of trees. The scenery created by the different colors of leaves in the fall is one of a kind. Merrideth Tunnel. Photo by Dan Talbott. Train station rest area. Photo by Dan Talbott.